Writing: Experience is the Best Teacher! In my 32 years of teaching, I have amassed quite a library of professional resources. Each one has made its own contribution to how I teach writing. The following are resources I consider the most valuable in introducing young children to the writing process. And the great thing is…you don’t need a purchased writing curriculum to accomplish your goals for young writers. You just need time to read and soak in all the goodness during the summer when you have time to read! Stick with me, and there will be a free writing template at the end of this post. 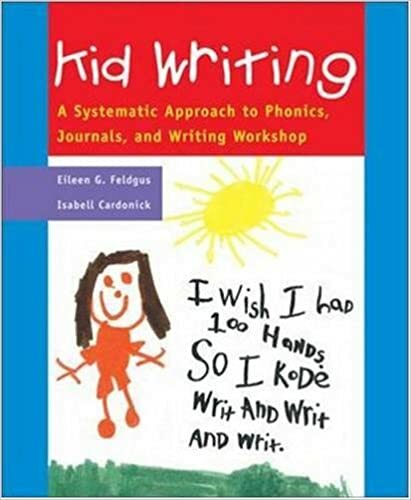 For more than 20 years, I have used the writing principles taught in KidWriting, by Eileen Feldgus, and Isabell Carconick. If you want kids to “get” the connection between the spoken word, and how it looks on paper, this method is it! It is the foundation of every lesson after my students have learned how to write letters. The basic approach to KidWriting is to meet kids where they are as writers. You begin with explaining how everything we say is a word that can be represented on paper. In the beginning, it may just be an underscore line for a word you cannot write yet. So a complete sentence may appear as a series of underscores, each one representing a word you said to describe your illustration. Teacher: I see you have drawn a bear. What would you like to write about the bear? Student: I like the bear I sleep with at night. His name is Ralph. Teacher: Let’s think about how many words you just spoke. I (1) like (2) the (3) bear (4) I (5) sleep (6) with (7) at (8) night (9). You spoke 9 words to tell about your bear. Teacher would have student to help count all of the words using their finges. Let’s write it down now. Student: I can’t write all the words, but I know some sounds. Teacher: Let’s write the sounds. Student writes: I lk the b___ I _____ w____ at n____. H__ n___ is R____. Teacher: Let’s read it together. I like the bear I sleep with at night. Could you write the letter that begins the word sleep? Student: Yes! Student writes the letter. Teacher underwrites to show what student has stated. All the while stressing how much their own writing is loved, and how many sounds they could think of on their own. I make a huge effort to draw match lines from their sound to the one I underwrote. They love this! This is the essential KidWriting lesson. It happens over and over again, instilling confidence and pride in writing. And it works! This awesome nugget of writing instruction came along several years ago when I began to notice students coming to kindergarten with little to no experience drawing. Not being able to draw a picture is a major non-starter for so many kids. Just telling students to draw a picture only worked with the students who had held a crayon or other drawing tool. So many do not have this experience. It occurred to me it was my job to bridge the gap, and add teaching drawing simple shapes and objects to my writing instruction. How (you might say) do I teach kids how to write letters? Through drawing and labeling! This is something Randee has outlined well, and it is how I begin every year’s new kinder class. They love it! She even includes a map for introducing the letters with suggested drawings. I love doing this with my students! Sometimes we create one big class chart with everyone writing a letter Bb, etc., or we write in our individual journals. We may do both in the same day. This daily drawing/labeling routine gives students experience with drawing. As they work, they are acquiring fine motor strength that will allow them to imagine what they can do on their own. This method of teaching drawing and writing has great value in a kindergarten classroom. Later on, we transition to directed drawing using Art for Kids Hub “how to” videos on youtube. My students love these videos! Eventually, confidence grows and we no longer need how-to videos to draw our illustrations. 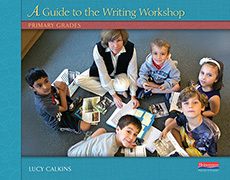 Your state’s adopted curriculum model in writing has its foundation in the Lucy Calkins model of writing instruction. It is the guidebook for most state writing standards. Being familiar with its structure will help you get standards covered for the year. There you have it! Where I differ in implementing writing instruction using writers workshop is the modeling aspect of writing. Students need to see what writing looks like. Therefore, we begin our writing with drawing, labeling, and finally short sentences that teach both sentence structure, as well as placement of text on the page, return sweep when we run out of space, and how our words make sence when they are organized. The time format mentioned in Randee Bergen’s book fits the age of our kinder students very well. It also has the added component of name work for ten minutes of the writing period. This is phased out as the year progresses. Because I am a true believer in improving your instruction game, I try to stay on top of new resources that have the seal of approval from other educators. 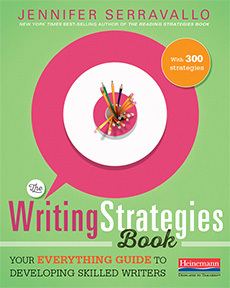 Jennifer Serravallo’s Writing Strategies book is amazing! She provides step by step Strategies, Teaching Tips, Prompts, and graphic examples of work. Every teacher needs this book! She also had input from Katie Wood Ray, a well known author of teaching writing using writers workshop. There you have it! My top picks for your summer reading. It’s coming, and most titles are available for your digital reading pleasure. Trust me, you’ll keep them handy all year.